Abbie Cornish is one of those actresses who I personally believe will be an Academy Award winner in the future. And I am not just saying that because she's Australian and I am Australian. Nor am I saying that based primarily on her latest role in "Limitless". Cornish won the AFI (the Australian equivalent of an Oscar) in 2004 for her breakthrough film role as Heidi in "Somersault", and she has recieved 4 AFI nominations. The roles she has undertaken are the calibre of those which are nominated for awards, but Cornish isn't afraid to lend herself to roles such as this one in "Limitless" or in the highly anticipated "Sucker Punch" which is released next month. Personally, I believe she was hard done by not recieving a Golden Globe or Oscar nomination for her role as Fanny Brawne in "Bright Star". She was just stunning in it and gave a heart breaking performance. However, it is a very competitive world out there, which goes without saying! When you watch as many movies as what I do, you tend to take a bit more of an interest in the opening credits at the beginning of a film and then you tend to start remembering people's names who don't usually get as much recognition by the general public as actors or directors. One such name which I noticed coming up over and over again was the producer Ryan Kavanaugh. A executive producer is the figure who is involved in the overall production of the film and handles the business deals. The main reason why I first noticed Ryan Kavanaugh's name is really because my mother's maiden name is Kavanaugh, but then it kept turning up and I thought "Wow, this guy must be really successful and know what he is doing". So what does one do when you wonder about something? Get on the Google! Well, I felt like I should have known who Kavanaugh was before now. He is an entreprenaur of Hollywood, the owner of Relativity Media who has had an incredible rise. He hasn't been in the movie industry for very long, but his list of credits include" Nine", "Brothers", "Robin Hood"," The Fighter" and now "Limitless". Kavanaugh definately knows what he is doing and I would love to know his secret...as I am sure many people do! He is a powerhouse in the business world of Hollywood. The onslaught of Hollywood action films continues. "Limitless" may look like just another action thriller on the surface, but it does have something that not many other films of this genre have. Originality. It's unusual these days to see an action film with a storyline which doesn't feel like deja vu. 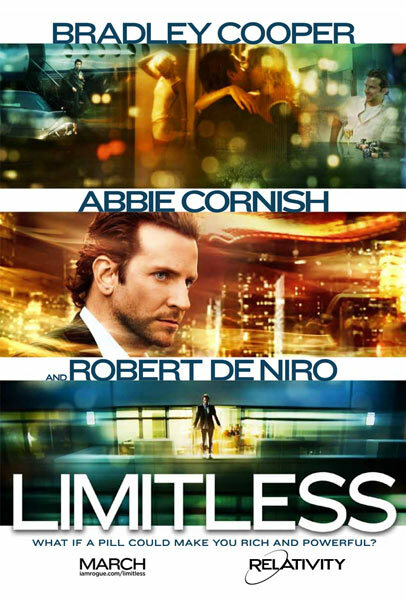 "Limitless" is fresh and entertaining. Based on the novel "The Dark Fields" by Alan Glynn, "Limitless" is a different look at the danger of substance addiction. Eddie Morra (Bradley Cooper) starts off the film as one might descibe as being a loser. He is a writer who has a book deal, but has not written a word and is therefore not earning a dollar. By chance, he bumps into his ex-brother in law, Vernon (Johnny Whitworth) who assures him that a pill which he gives him will fix all his problems. After Eddie takes this pill, he is able to absorb information quicker and his brain works at a higher level than the everyday person. Eddie quickly becomes addicted to this drug known as MDT and although the quality of his world increases dramatically, the danger and fight to stay alive begins. What is so refreshing about "Limitless" is that it isn't a thriller based on the run from the guys who are after you (although parts of the film do lean towards that) or finding out who are the killers. It is a thriller about a fight against addiction, which is something that many people will be able to relate to. It is almost as if the film serves as a wake up call for some and contains some very real situations that individuals addicted to a substance may encounter such as not being able to pay people back for their addictions and facing financial difficulties with another party, and also the effect it has on your physical and mental health. Not to mention the effect it has on the relationships with those around you. The script is very clever, as one might imagine in a film where the lead characters intelligence increases and he obviously pretty smart things to say. However, the film itself is not as suspenseful at times as it is supposed to be. The reason for this is that it quickens pace and then slows down, and this happens several times throughout the film. There is suspense, and then there is a period in which it's intensity is lowered dramatically. This happens various times throughout the film and this is why the suspense is not consistently maintained, which is actually quite frustrating. The ending is also very anticlimatic and should have finished at least 10 minutes earlier. Yet, this does not destroy the film as it is still entertaining whether it is slow or suspenseful. It is easy to see how Neil Burger would have had fun directing this film and the overall visual surface of the film is quite impressive. There are some great film sequences and visual effects used which are quite attractive and impressive to watch. Although some of the effects may make you suffer from motion sickness. "Limitless" is actually a good showcase of types of visual effects, cinematography and editing which are used in Hollywood action films today. New York City is definately put on show through the filming of this film as well and features heavily in the cinematography, along with the visual representation of Eddie's mind. Bradley Cooper carries the film well. The best part of the film for him is the beginning where Eddie is rough and ragged and when he experiences his downfall in health and luck. He is so great in this part because it is completely different to the characters which he normally portrays in films. Sure he looks completely different, but you really feel sorry for him in the way which he carries himself and the sorriness in his eyes. Once he becomes the successful Eddie, it is much like any other Bradley Cooper role. Bradley Cooper does Bradley Cooper roles well so you can't really fault the performance. Abbie Cornish is charming as his girlfriend, Lindy and this is actually quite a different role for her. Her and Cooper do also have a great on screen chemistry, which really helps support the film. It is good to see Robert De Niro back on the big screen and he does wuite well in this role, as one would expect from him. He plays Eddie's business partner/boss, Carl Van Loon and he does definately come across as a character who you would love to have on your side, but would hate to have against you throughout the film. "Limitless" is one of the better action thrillers released this year. Neil Burger should be applauded for taking on a film which required a lot of originality and creativity to make it work on the screen and pulling it off. It is not often a book which has a story to it that one would normally think should be left as a book as it wouldn't work on screen, does really tell the story and tell it effectively. That really is something to be proud of and is the sign of a great director. Limitless – the movie (Dvd and Blu-ray soon) starring Bradley Cooper – (Hangover 2), is GREAT due to the theme! UFO’s, Bigfoot, and Time travel MAY exist / be proven one day….the UNIMAGINABLE POWERS of the Subconscious Mind are not a myth – they are REAL, and can be systematically and intentionally “tapped” into RIGHT NOW — if you know how.. I have done it myself – now am a HEALER / Subconscious Mind Consultant — show others the way…..The Stairway to Heaven Manuscript is my written “blueprint” to reaching Infinite Intelligence / the power that the subconscious mind “taps” into….